Combine barbecue sauce and wine in small bowl. Pour around brisket; bring to a boil. Reduce heat; cover tightly and simmer 2-3/4 to 3-1/4 hours or until brisket is fork-tender. Remove brisket; keep warm. 388 calories; 12 g fat (5 g saturated fat; 5 g monounsaturated fat); 137 mg cholesterol; 402 mg sodium; 14 g carbohydrate; 1.0 g fiber; 50 g protein; 7.4 mg niacin; 0.6 mg vitamin B6; 3.6 mcg vitamin B12; 4.7 mg iron; 46.9 mcg selenium; 11.5 mg zinc; 190.9 mg choline. To cook in a slow cooker, combine rub ingredients in small bowl; press evenly onto beef brisket. Place brisket, fat side up, in 4-1/2 to 5-1/2 quart slow cooker. Combine barbecue sauce and wine in small bowl. Cook on HIGH 4 to 6 hours or LOW 8 to 10 hours, or until brisket is fork-tender. (No stirring is necessary during cooking.) Remove brisket; keep warm. Bring cooking liquid to a boil in a sauce pan. Reduce heat to medium and cook, uncovered, 8 to 10 minutes or until reduced to 1 cup sauce, stirring occasionally. To smoke beef brisket, prepare charcoal or gas smoker according to manufacturer’s directions. Combine barbecue sauce and wine in small saucepan; bring to a boil, stirring frequently. Reduce heat to medium-low; cook 7 to 8 minutes or until reduced to 1 cup, stirring frequently. Reserve 1/2 cup barbecue sauce for serving. Prepare rub as above; press evenly onto beef brisket. 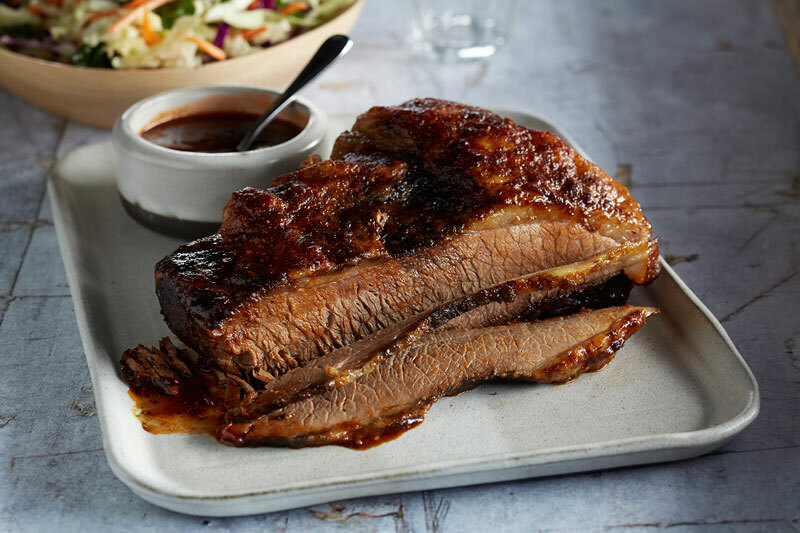 Smoke brisket according to manufacturer’s instructions and cooking times or until fork-tender, brushing occasionally with remaining barbecue sauce. Carve brisket as above. Serve with reserved sauce. 517 calories; 17 g fat (6 g saturated fat; 7 g monounsaturated fat); 183 mg cholesterol; 536 mg sodium; 19 g carbohydrate; 1.3 g fiber; 66 g protein; 9.8 mg niacin; 0.8 mg vitamin B6; 4.8 mcg vitamin B12; 6.3 mg iron; 63.6 mcg selenium; 15.3 mg zinc; 254.6 mg choline.